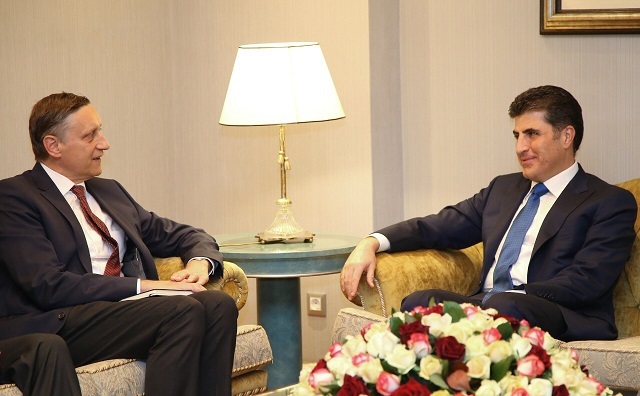 Erbil, Kurdistan Region, Iraq (cabinet.gov.krd) – Kurdistan Region Prime Minister Nechirvan Barzani received German Ambassador to Iraq Cyril Nann and his accompanying delegation. In the meeting both sides shed light on the latest political, humanitarian and post-referendum developments and agreed that tension and aggressive statements will not help resolve the issues and that dialogue and negotiations are the best way to address issues between Erbil and Baghdad. They also discussed Erbil- Berlin relations and best ways to further promote them. Mr. Barzani thanked the German people and government for their humanitarian and military support to the Kurdistan Region. He also stated the reasons that pushed the Kurdistan Region to hold the independence referendum last month and emphasized that experiences with Baghdad proved that pre-referendum relationship with Baghdad was not functioning and that a new kind of relationship should be adopted. Prime Minister Barzani reiterated KRG’s readiness to hold serious and unconditional dialogue with Baghdad and pointed out to the positive role the international community can play in the process. 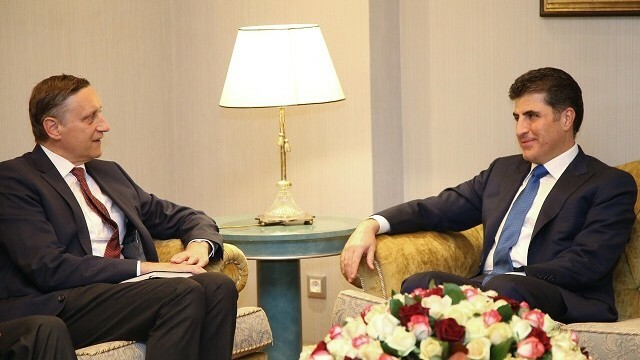 Ambassador Nann said that Germany is following the developments in the Kurdistan Region and Iraq with interest, stressing that his country is ready to help and support the dialogue between Erbil and Baghdad. He also praised the role of the Kurdistan Peshmerga Forces in the fight against terror and commended the KRG and the people of Kurdistan for sheltering and helping a large number of internally displaced persons and refugees.